Are you falling in love with the furniture makeovers on Pinterest? But not sure where to start with your current furniture or a piece you picked up impulsively? 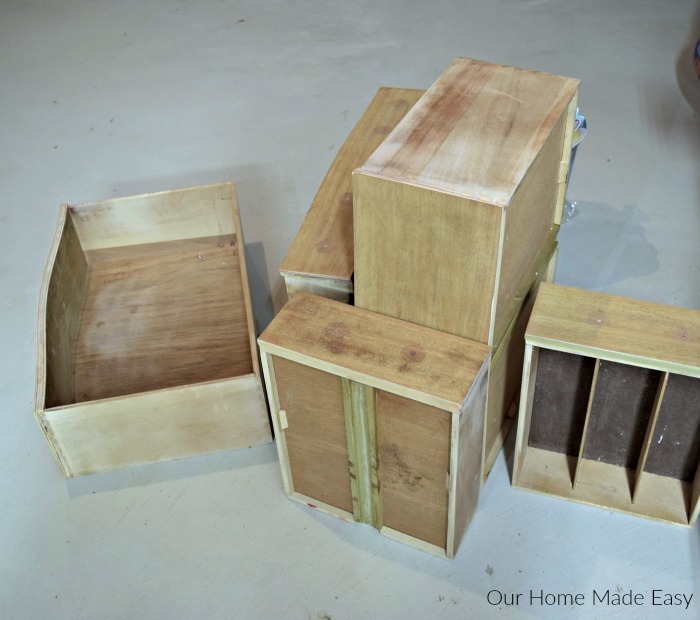 If you are ready to tackle a new furniture project, this post is for you. With a bit of sweat equity, you can take any Craigslist buy and really turn it into something ready for your home! New furniture isn’t always in the budget for young families. Sometimes you have to use what is on-hand or pick up finds on Craigslist or Facebook groups. Or, you may enjoy the challenging of finding new furniture and bringing it back to something cool & modern or chippy & farmhouse (a’ la Joanna style). For this piece, I redid it years ago [you can see the refinished buffet post here] and after figuring out my home style, decided to forego the RED and choose a color that is better for us. But before you get to make an old piece of furniture new, you have to strip it down to its bones! 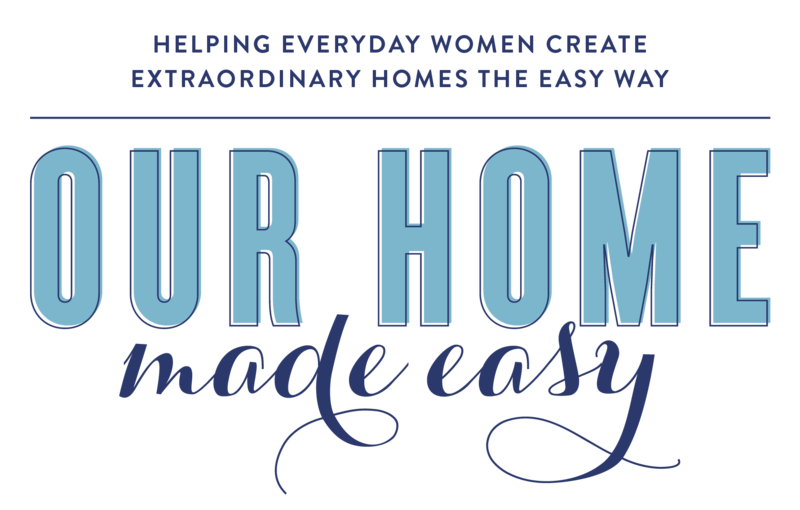 I cannot wait to show you the easy way of doing it yourself! Related: Fusion Mineral Paint: Is It Worth It? Remove all old hardware, including door hinges. To save yourself lots of effort and time, spend about 10 minutes and sand over your entire piece with coarse sand paper. Make sure to sand in direction of the wood. What you’re doing is prepping the remover to do an even better job than its advertised. I’ve found that a bit of effort goes a long way when you have furniture with wax or special finishing on it (like mine!). While this process is easier and safer than more traditional methods, it will still take some time. You have to wait in between remover coats and then there is some physical labor involved. Easy yes, but prepare to spend a bit of time on it depending on the size of your piece. Make sure to get into every nook and crannies on your piece. 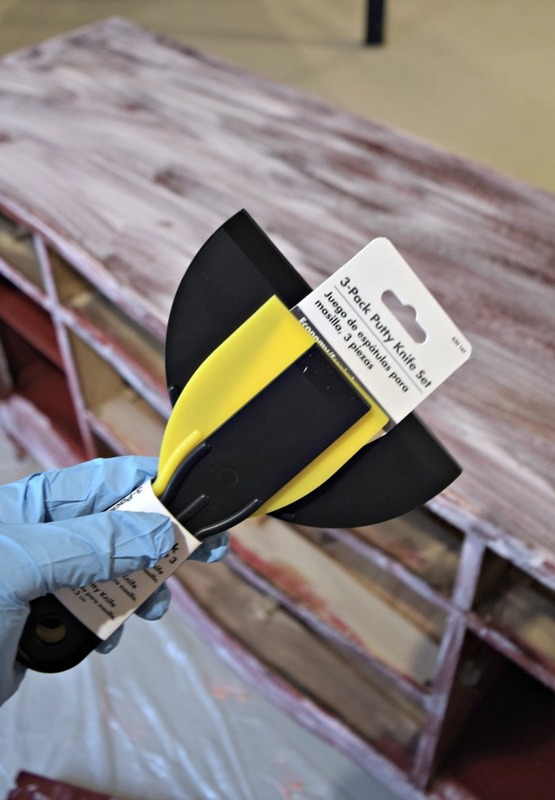 The paint won’t remove unless there has been product directly applied to it. Since it’s so thick, I ‘painted’ the remover on the legs and sides and it didn’t budge too much. The best part about this product is that I wasn’t worried about removing the paint in our basement. It advertises low fumes so I felt comfortable diving in and DIY-ing even in the Michigan weather. If you can, open a window to circulate the air. While it’s not necessary, it will help keep the orange scent moving through. After about 2 hours of letting the Citristrip lying on top of the wood, begin removing the paint. Start off easy and use plastic putty knives. You can see how the paint and varnish came right off. I thought it was pretty cool. The wood is still wet underneath and will be for at least 12 hours after you’ve finished removing the paint. Use clean cloths to wipe up paint and residue as you go. Otherwise, you’ll end up with paint pieces all over the floor and you don’t want to be stepping in them. Inevitably you will not be able to remove every piece of paint. I’d then recommend that you use a mini wire brush to help you out. We used it for the nooks and crannies that aren’t practical for putty knives. The wire brush quickly removed any extra pieces. Reapply another coat of Citristrip, if desired. Now you can see that there are still some areas that need extra attention. For these, use a more potent paint remover. My first goal was to use a low VOC product first, then go stronger, if needed. 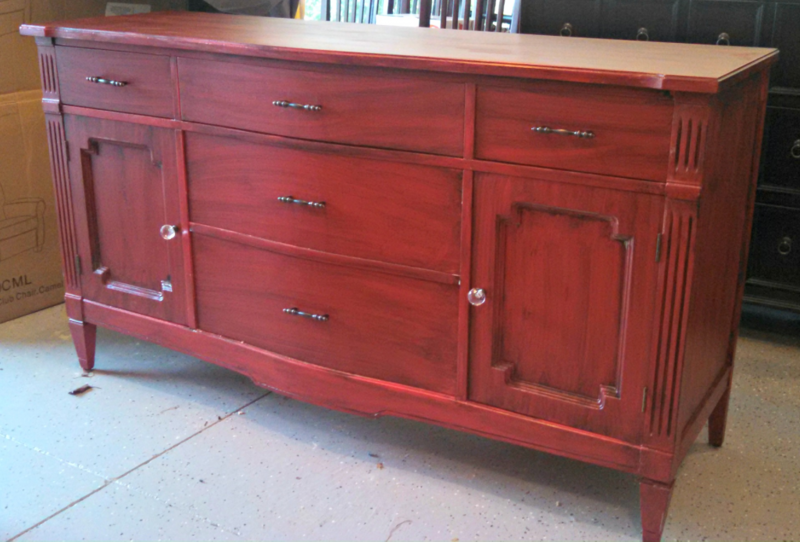 After at least 40 years of varnish and paint, this buffet needed just a tad bit more product. 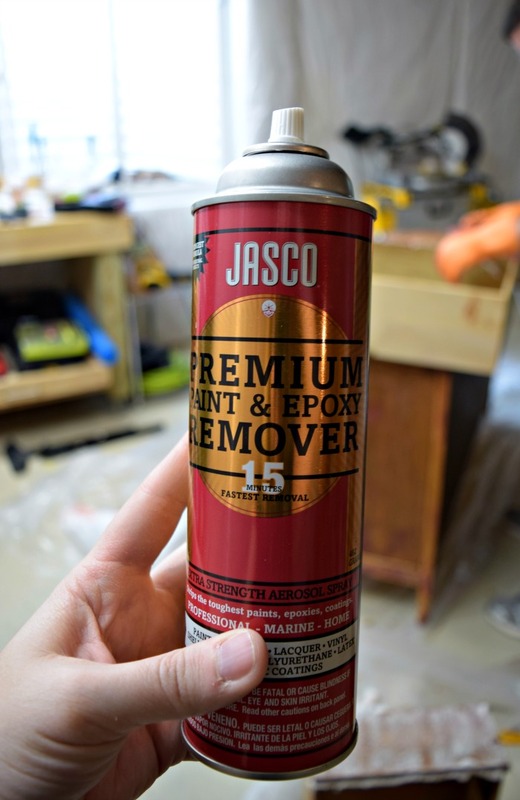 I then used this JASCO Paint Remover. Want to skip to see the after? I created a beautiful two-tone furniture buffet! Don’t worry- you may not need to apply the second product. I needed to because I had latex paint AND a thick wax lying over it. It simply made for a difficult removal. Using your cloths, wipe down your item. Then, using an orbital sander, sand over the entire piece using a fine grit. 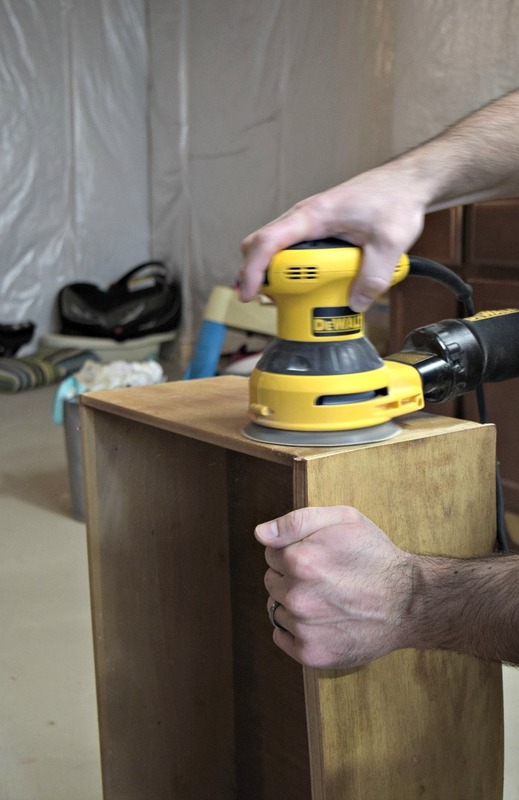 Be sure to be firm while sanding and still going in the moving in the general direction of the wood. 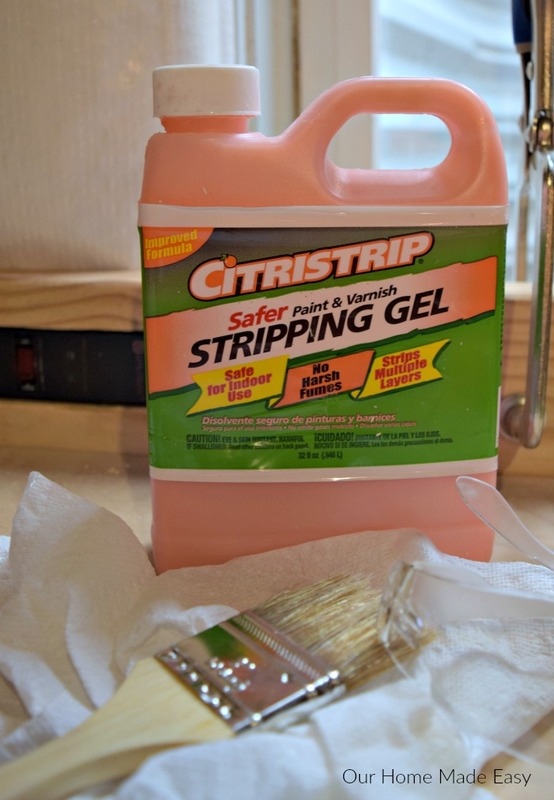 Wipe off any sanding residue! 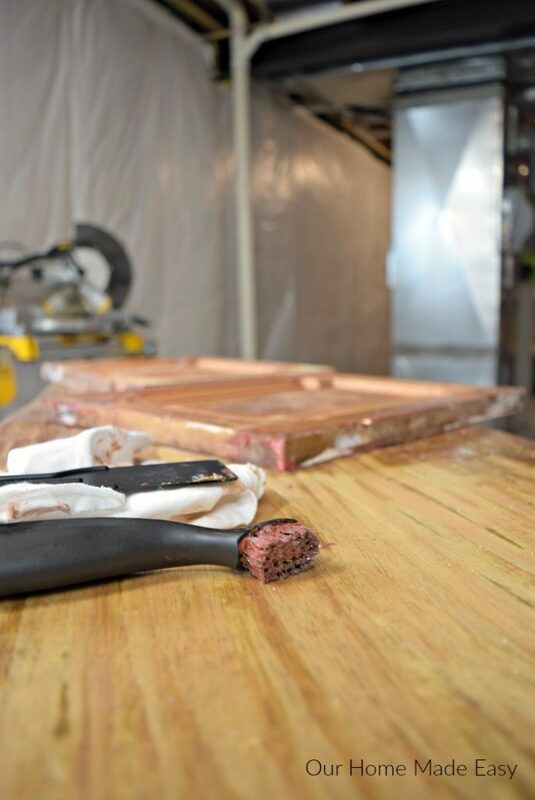 Now your piece is ready for its next step– refinishing! 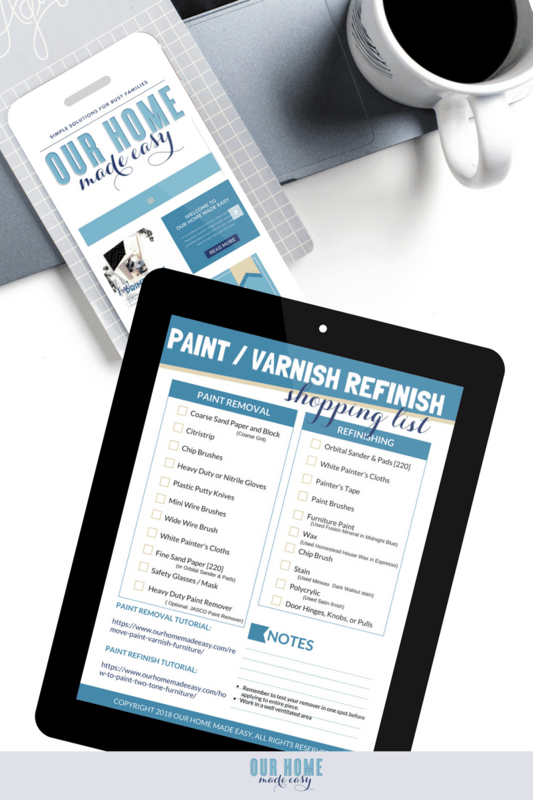 Get This Entire Project’s Shopping List Right Here! Click the image below for the shopping list! And ta-da! Super clean furniture ready for its debut in the house (Okay it’s really a re-debut, but you get the idea). 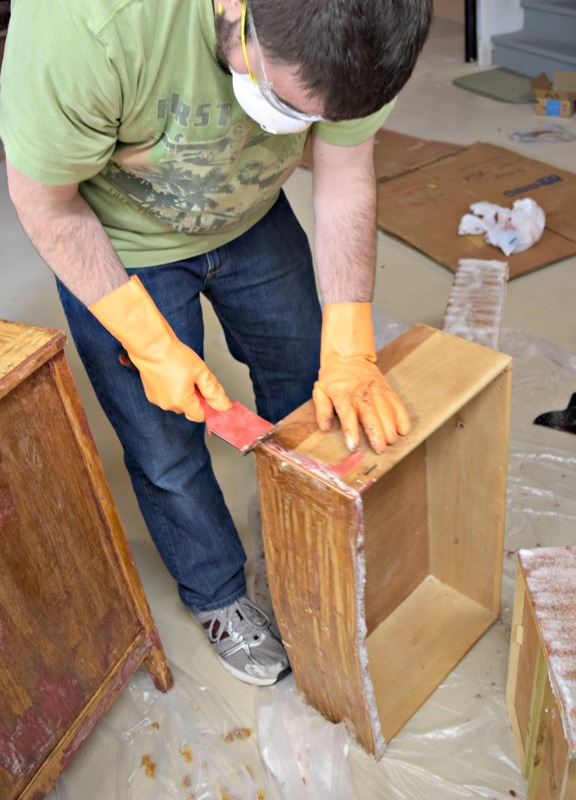 Removing paint and varnish from old furniture isn’t always quick, but it’s not hard either. Prepare yourself with a few handy tools and a bit of patience. You’ll be excited about redoing furniture and no longer wondering what it really takes to make a cheap find ready for your home! 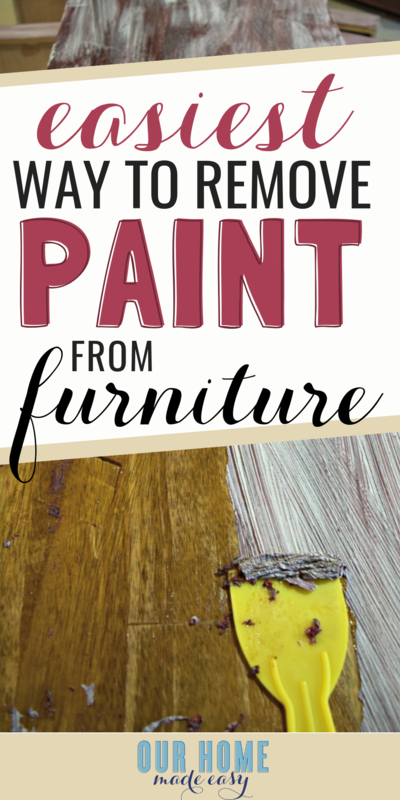 Check out the ‘AFTER’ for the second part of this post where I show you how to create a two-tone piece of furniture that is taking over all your favorite home blogs! Want to remember this for later? Pin this image! 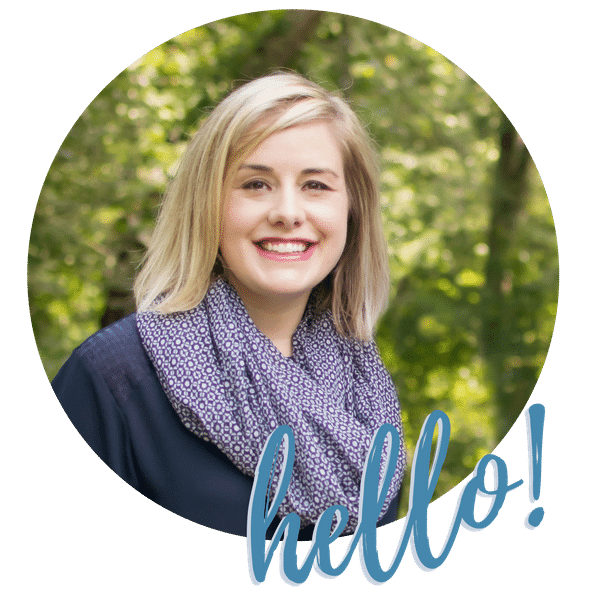 « The One Thing All New Bloggers Need to be Successful! This is a great post! I’m saving this for later because I had no idea how to strip off the paint from a piece of furniture like this. I’ve avoided buying already painted pieces from thrift shops and other places because of that! Thanks for walking me through this 🙂 I can’t wait to see the finished product tomorrow. Thank you for sharing your knowledge and skills. Great job and you have no idea how many people you help. In 1975 took a furniture refinishing course at our local community college and was told by the instructor to NEVER use sandpaper on an old piece of wood. Instead use extra fine steel wool; .It’s so much gentler on old wood. I have been stripping furniture since, I paint on the product (I’ve used a variety of brands) After brushing it on I scrape off the paint remove the paint I go over I wipe it down with a liquid paint remover or some sort of solvent with ex fine steel wool to remove any bits of paint and to smooth out the piece. I use extra fine steel wool for getting into crevices and edges as well. 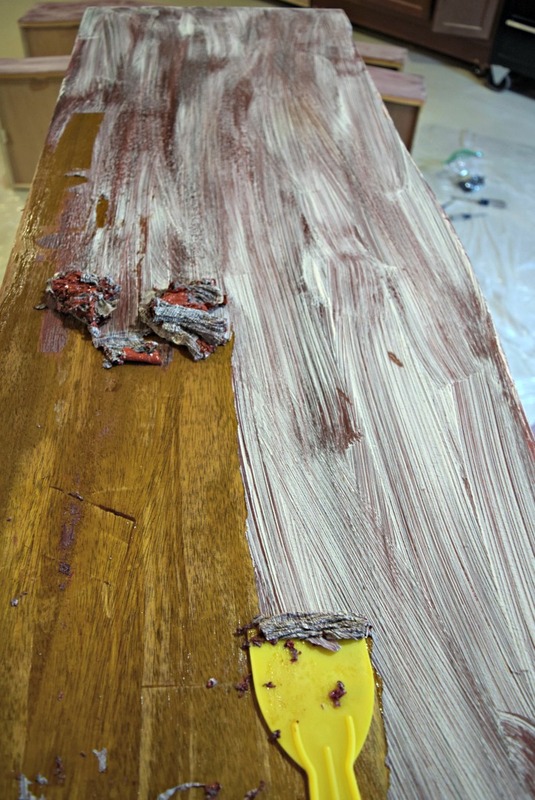 I apply one or two layers of liquid stain with cheesecloth , depending on the depth of color I prefer,letting it dry for 8- 12 hours in between. The I brush one or two applications of the the finish, I sue a product call ZAR, then buff it after waiting 8 hours in between. That’s my method, it’s time consuming but the results are spectacular! Thank you for this in depth tutorial. I have an old exterior door that I’ve been wanting to redo and use as our front door but I had no idea how to get rid of the layers of paint on it and I’ve been afraid of ruining it. This has inspired me to give it a try. Oh my goodness! This article is awesome! The Citristrip was the best recommendation ever! It was taking the paint off as I was painting it on! Made the rest of my DIY job so much easier. Thank you thank you thank you! Heather I just stripped a dresser that was stained and sealed. I used paint thinner and denatured alcohol.. 50/50 let it sit for less than a min used a scraper and scraped it off. you may have to do it a few times however it works… then i just sanded and now im getting ready to re stain it…. Thanks Summer! 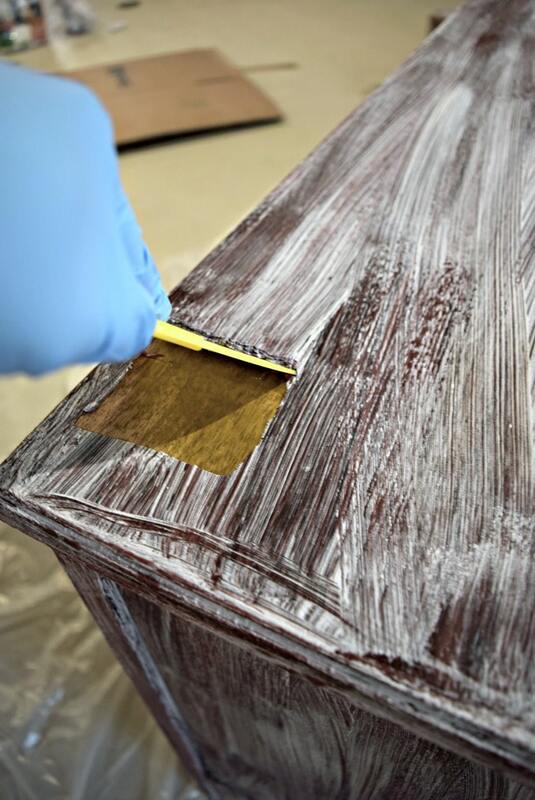 Are you re-staining it or painting it? 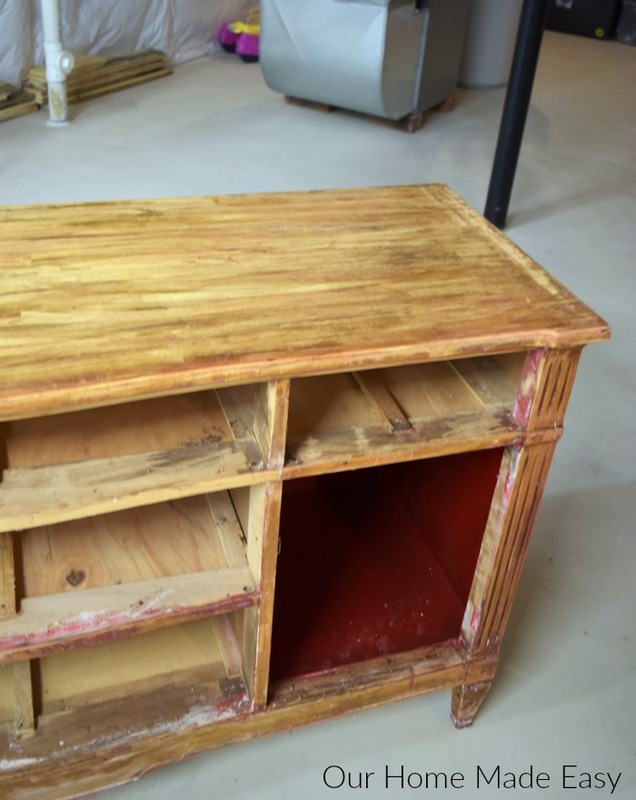 Amazing transformation from old furniture to new furniture. Such an informative post you share that give me a plenty of help for my home DIY project. 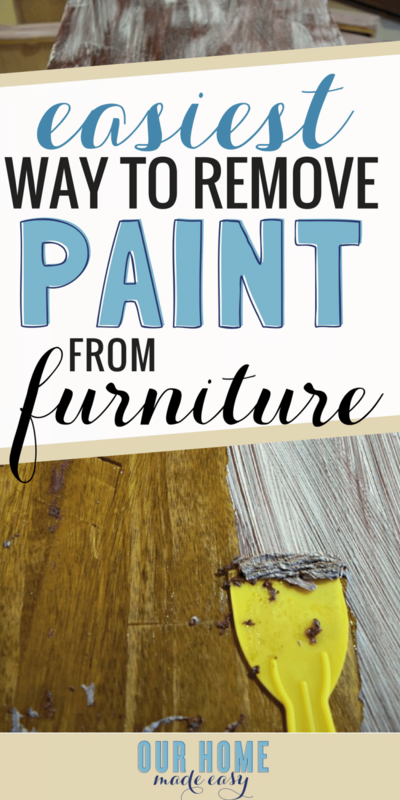 i wanted to thank you for explaining how you can remove a paint varnish from furniture. you mentioned it’s important to try to first remove all the hardware. It sounds important to make sure the hardware is removed safely so it doesn’t damage the rest of the furniture.